Cohansey River - at anchor - they all lie! At PYC - Our season starts! With a north wind, the face dock at Elizabeth City was calm for the night, no problem. Rudy and Alison got their car from Enterprise in the morning and returned to the dock to load up for the trip home. Enterprise is not the best choice for a one-way rental car since they charge a substantial drop off fee but there were no Hertz rentals nearby. 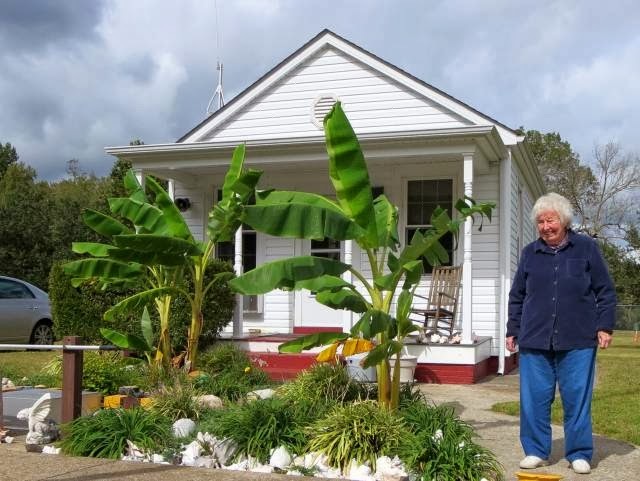 So now we're by ourselves for awhile but we'll be visiting with Don and Liz Bunch and also Bill and Pat Zeising during the latter part of the week. 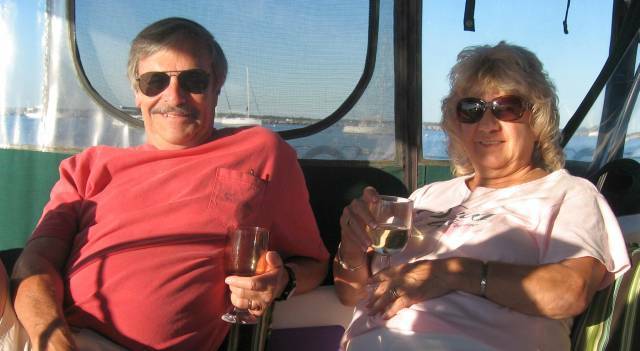 Both couples were long time members of the Poughkeepsie Yacht Club and close friends. 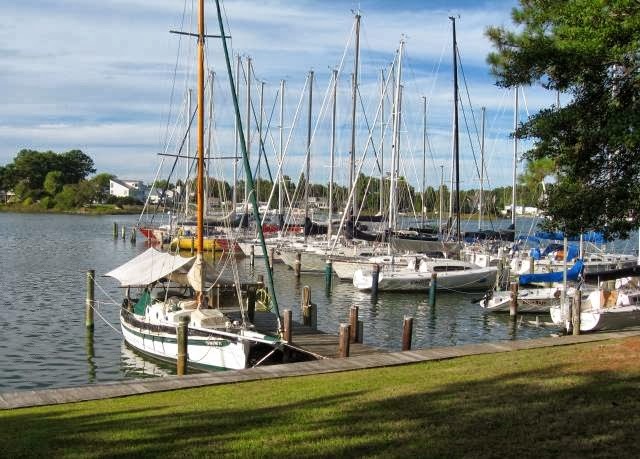 Tonight we're at the Alligator River Marina, the favorite marina of Mike Quick (as expressed in his blog in the spring). The event of note was that we finally met Miss Wanda! 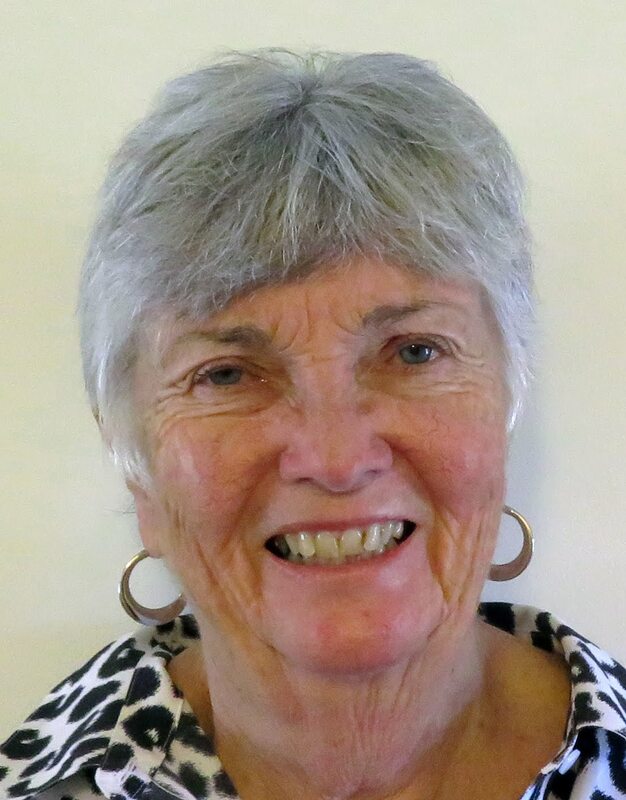 She's the owner of the marina and we've always received a Christmas card from her every year but never met her. She dropped by to say hello this afternoon and it turns out that she's headed to Key West too in February so we told her to drop by when she's in town. As Mike Quick has reported, there's not a whole lot to this marina, it's mostly a gas station with a small, fast food restaurant inside - with a few docks. What they do have it location. 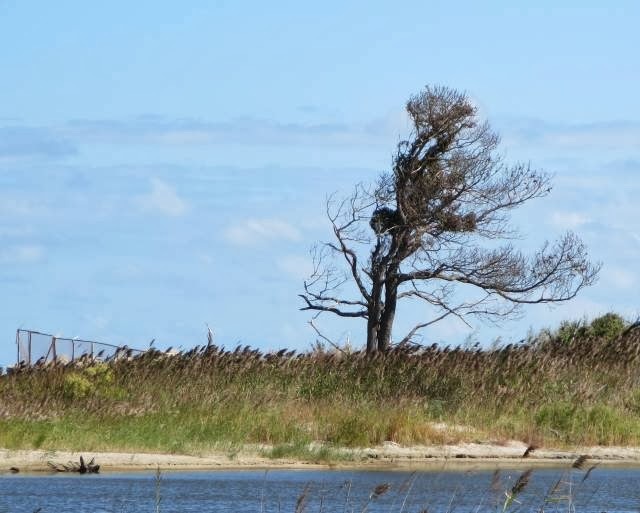 It's conveniently half-way between Elizabeth City and the Pungo Creek anchorage with the plus that it doesn't have the fuzzybill problem. If you anchor near the Albemarle River (it's on the way) then you run the risk of being visited by fuzzybills! They are small insects that look like mosquitoes but aren't really (they don't bite). They have a nasty habit of dying overnight and leaving a green goo residue all over your boat, ugh!! After one experience with that (a 5 hour cleanup), we decided that the Alligator River Marina was a better bet. We haven't seen fuzzybills in here. 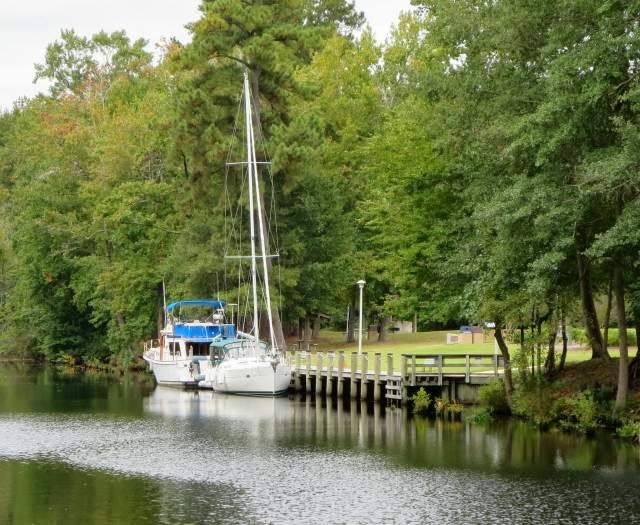 On Tuesday we're headed to the Pungo River anchorage for the night before traveling on to Washington, NC to Don and Liz Bunch's dock. The answer to yesterday's quiz was "B" although "C" works most of the time - but not always, especially where the ICW splits into two channels. Always go by the yellow inserts, a triangle for a red and a square for a green ICW marker. Elizabeth City knows how to welcome boaters! The thing we like about the visitor's center in the Dismal Swamp are the quiet nights. The wind cannot get at the boat since it's surrounded by tall trees and there's no boat traffic since the locks are closed at 3:00 pm, perfect stillness. The visitor's center has a special section just for boaters with free WiFi and a loaner library. The adjacent wildlife center is open until 4:30 and free for our use. All in all a very good stopover. 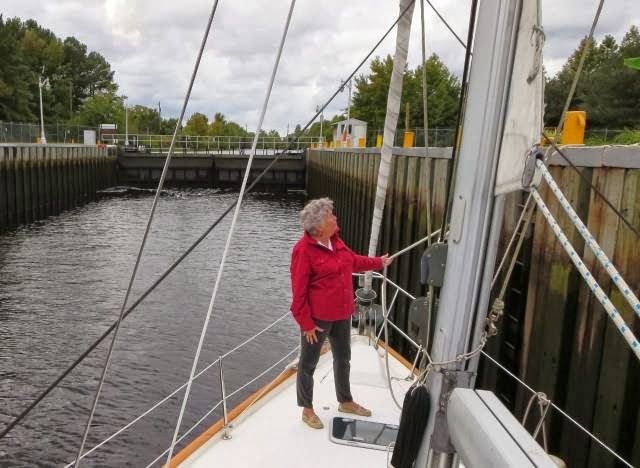 We left around 10:00 to make the 11:00 am lock opening and then motored on to Elizabeth City. We took the bulkhead dock just west of the bridge so our crew would have easy access to a parking area for pickup on Monday by Enterprise Rent-A-Car for their drive home. We'll be without crew for awhile. 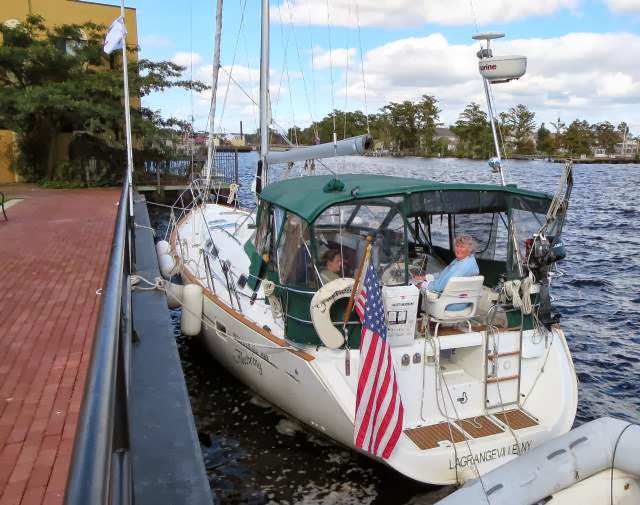 On Monday we're headed for Alligator River Marina and then on to the Pungo River anchorage to arrive at Liz and Don Bunch's condo by Wednesday if the weather holds up and nothing else sets the plans amiss. They've reserved a slip for our use while there so we'll rest up a bit before continuing south again. You're headed south down the ICW which normally requires passing red markers on the starboard side and green markers on the port side. 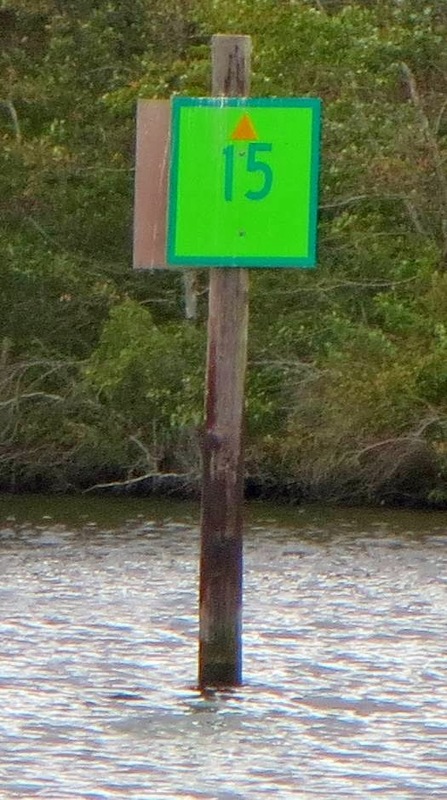 In exiting the Dismal Swamp canal you see the markers as pictured below. What do you do? A. Yeah, I can tell red from green, I've been passing reds to starboard for 100's of miles and by God I'm going to keep doing that! B. Nevermind the colors, pay attention to the yellow shapes. Pass yellow triangles to starboard no matter the color of the markers and the yellow squares to port. We left Hampton at 6:45 am in order to ensure making the 9:30 opening of the Gilmerton Bridge so that we would also make the 11:00 am Dismal Swamp opening. So deadlines piled upon other deadlines and I got up at 5:30 to start getting ready. Entering the Dismal Swamp, we first see palm trees! Somewhat to our surprise, the wind piped up and surpassed 20 kts as we headed towards Norfolk and we rocked and rolled. We were fortunate to reach Hampton before the winds turned strong later this week. As we entered Elizabeth River, the winds persisted but they had no reach and so little wave action. As it turned out, we were 1/2 hour ahead of time for the bridge but we wanted the extra safely margin since we could have been caught at either of the two railway bridges before Gilmerton which are normally kept open but close when a train approaches. 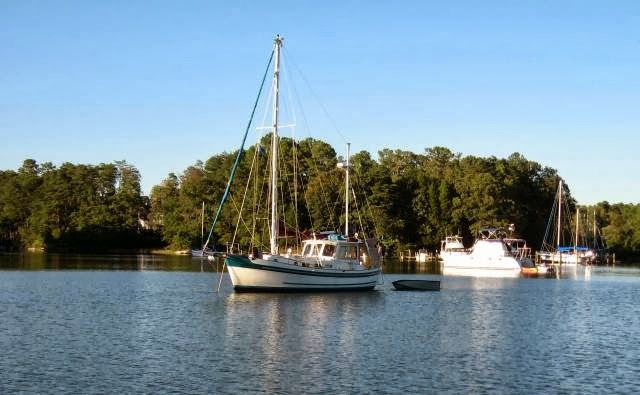 We were also surprised that we were the only sailboat waiting for the 9:30 opening and as we turned into the Dismal Swamp entrance, we were all alone. Eventually a small motorboat joined us as the lock was opening and we continued on into the canal. We were greeted with duck week from shore to shore for the first 14 miles, ugh! Eventually we ran out of it and the rest of the trip to the welcome center was almost without incident. As we approached the free docks, we saw a mat of grass in the middle of the fairway so we swerved to avoid it and didn't notice the overhanging branches of a large tree on the side. Fleetwing swiped the tree limbs and branches came tumbling down! Luckily, the branches only touched the shrouds and not the top of the mast where the wind speed sensor was located! So there was no damage but a lot of surprise at the resultant gravity fall of tree debris onto Fleetwing. Just the start of our adventure! After that bit of excitement, we finally docked Fleetwing next to the only other boat present, a trawler going north, and we settled in for the night. The welcome center has an interesting nature display that's free so we all marched over to see that along with several nature trails, interesting. Hummm, I think we got too close to a few trees! We'll set out at 10:00 am on Sunday to overnight in Elizabeth City where Rudy and Alison plan on leaving Fleetwing for home. 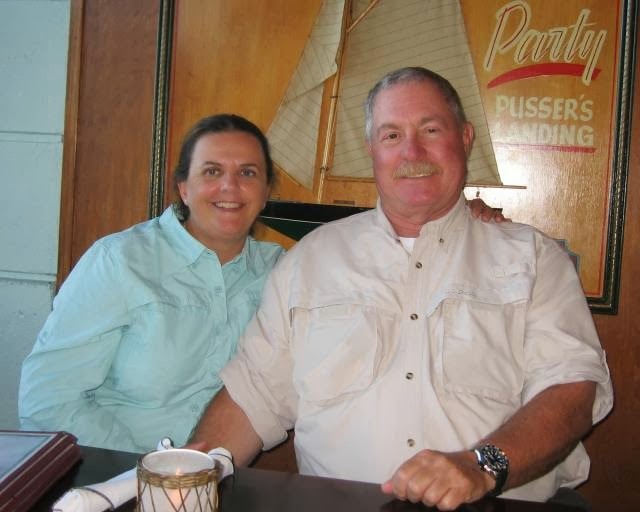 We'll continue on south and meet up with former PYC members Don and Liz Bunch and hopefully Bill and Pat Zeising at Washington, NC. We look forward to seeing long-time friends! When we want to provision, we usually rent a car from Enterprise for about $35/day including tax. The city marina at Hampton has an Enterprise rental office within 100 ft of the docks, very convenient. So off we went to first get a replacement camera for the one that malfunctioned, another Canon but this time the 330 HS model. It still has the best features I want and it's relatively inexpensive at $179. This model upped the zoom to 10x and added a function to transfer the photos to my iPad wirelessly, no WiFi or internet connected required. 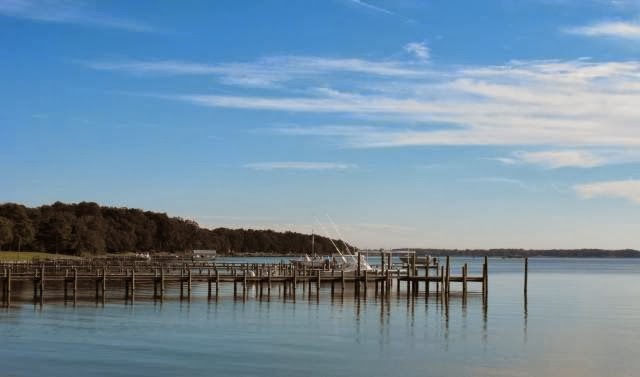 After a trip to Best Buy, we dropped by a Walmart Supercenter for groceries and Hampton has one of the best Walmarts we've seen up and down the ICW. So it was a successful day of getting ready for the rest of the trip. Walmart now has a family sized rotisserie chicken and we found it will feed a party of four, all for $8.88, not bad. Saturday is an early morning rising since we have to make the 9:30 bridge opening to have time to reach the Dismal Swamp lock opening at 11:00. With that schedule, it's off at 6:45 am, heading south by all the Naval shipyards, quite a sight. We'll overnight at the welcome center and hopefully won't have to tie up to someone else. There's room for about four boats, anymore and the late arriving boat have to tie up to the outside of the boats already there - and walk over your boat to get to shore. However, that's part of cruising down the ICW. 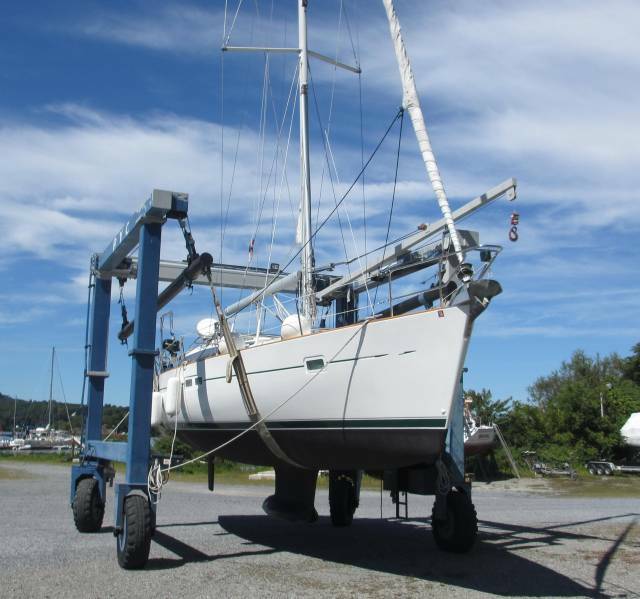 We were pretty tight in the dock at Fishing Bay YC so we fended off as Ann backed Fleetwing out of the dock. She turned smartly and off we went. We negotiated the narrow, winding channel once again without an incident and we headed out. 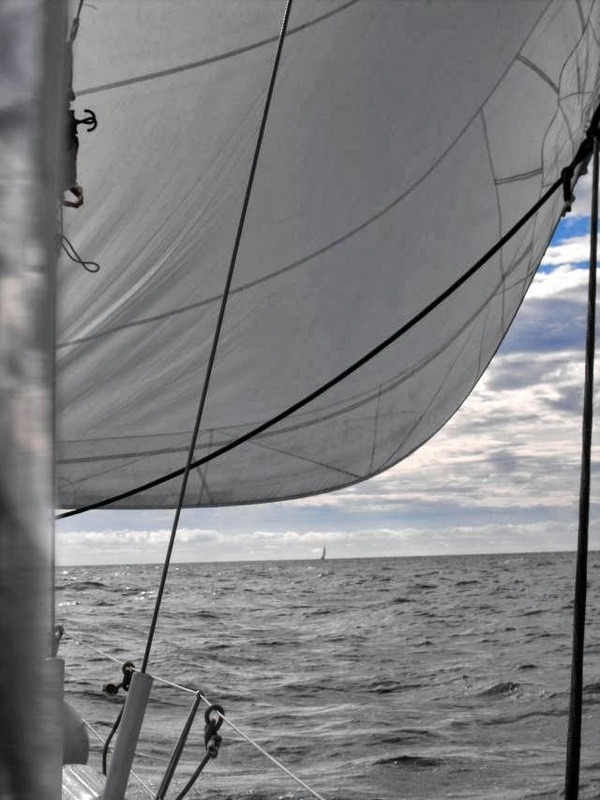 The wind piped up this morning to 15 to 20 kts and we were able to sail south for almost two hours before the wind died, the first time we ever sailed in the Chesapeake the last three years. 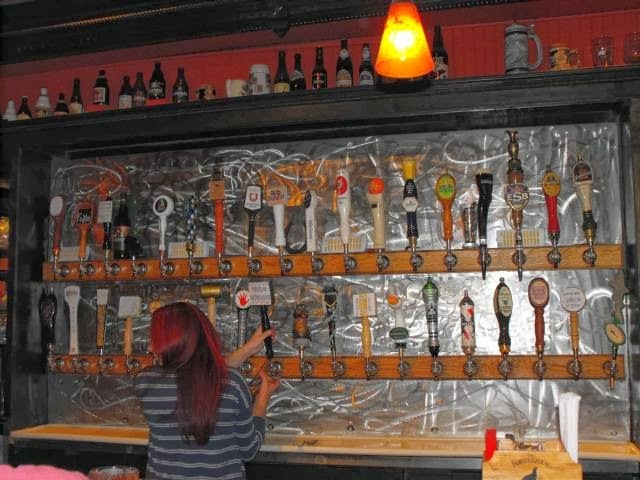 What a great selection of beers on tap! We reached Hampton Downtown Public Piers by 2:00 pm and had some challenges getting into our slip since it's at right angles to the flow of current and wind. However, no damage was done and we regrouped in the cockpit. Later on we marched over to The Taphouse Grill for a selection of beers on tap and pub food. Both the beer selection and the food is excellent with both at very reasonable prices. We always stop by on our way north or south. On Friday we'll provision and I'll find a new camera to replace my Canon 310HS that refuses to retract the lens back into the case. There was nothing obviously wrong with it, no hits, etc. but it just hangs up when turned off now and the lens stays out and won't take a photo. We'll do some sightseeing with Rudy and Alison in the afternoon. On Saturday we'll continue our trek south through the Dismal Swamp, hopefully it'll be a little deeper than last spring when we constantly hit logs laying on the bottom. On yesterday's quiz, the correct answer is "B", follow the markers! 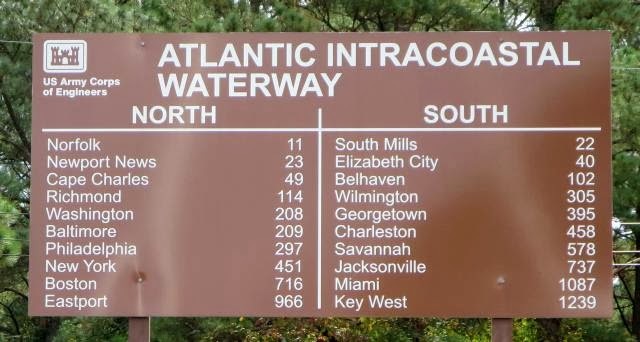 Although the GPS is accurate to a few feet, the charts are not and are often off 20 to 50 ft which can make a big difference in finding deep water on the ICW. No quiz tonight, take the day off! The weather has just been extraordinary for a quick transit down the Chesapeake Bay this year! We had some wind behind us, not enough to push us at the speed we wanted but enough to help some. The water was flat, a rarity from our experience. We took advantage of the good conditions and headed south at 7.7 kts (with a fresh bottom we can cruise at 7.7 kts instead of our usual 7.3 kts). Fishing Bay YC is in Deltaville and you have to pass through a narrow passage to reach their docks. The channel is very well marked but it is very narrow, no room for error. 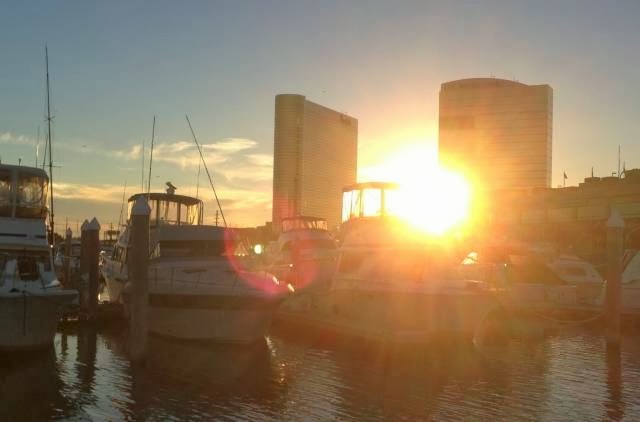 They have a policy of offering members of other yacht clubs one free night's dockage. So we took advantage of the offer and have a dock for the night with free water and electricity. 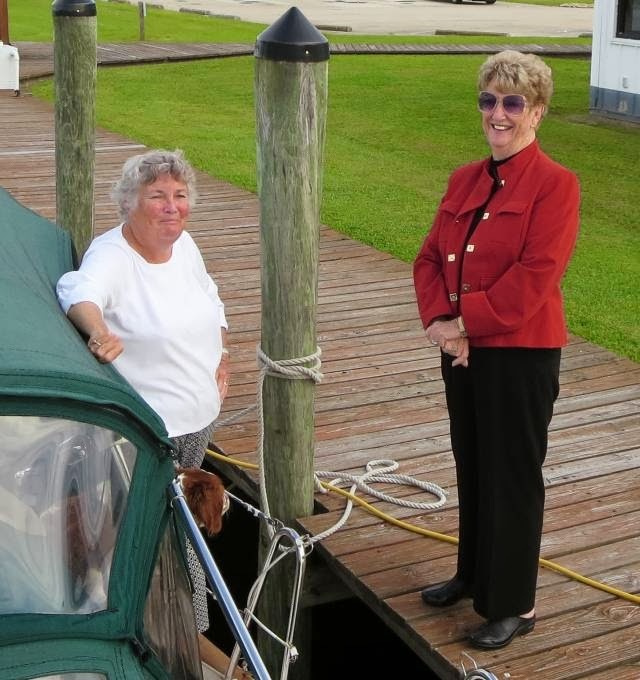 The members are friendly and we had help coming into our dock. Our crew took advantage of the well kept and clean showers! We only have 40 Nm to go on Thursday so we'll have a hearty breakfast and not have to leave until 9:00 am. We'll be at Hampton by 3:00 or so for a two day stay. The answer to yesterday's quiz is "C". 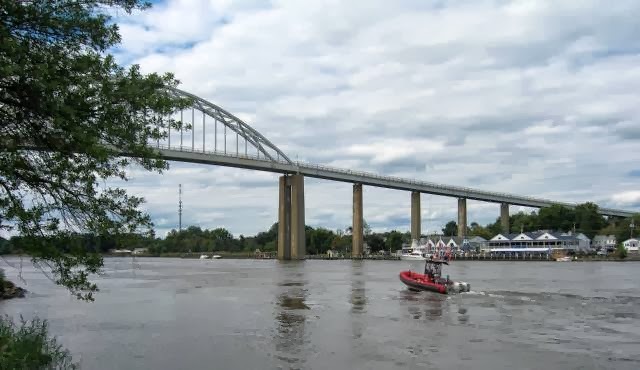 There have been documented cases where the bridge operator closed a bridge on top of a sailboat passing underneath, claiming that the sailboat did not request an opening. I personally know of at least three cases. Q5: You're going down the ICW and in looking at your chartplotter, you find that the ICW marker is in the middle of the channel as displayed on your chartplotter and in some areas, the magenta line (the preferred path per the chart) passes the marker on the wrong side. What do you do? A. Follow your chartplotter since your GPS is accurate to a few feet, even if it shows you going outside the markers. B. Nevermind your chartplotter follow the markers and stay between them! C. Split the difference to average out the errors. We made it down to the Somonos by 2:30 after leaving Annapolis at 9:00 am. The weather was perfect as predicted (one wonders what surprises the weatherman is saving up for us...) as is the prediction for the next two days, enough time to reach Hampton, VA. The wind was behind us and with only 1 ft waves, we cruised down the Chesapeake in comfort. Alison had her surprise birthday gift from Rudy, starting out with an empty box (just to keep her guessing) but she finally opened the last box for the necklace she wanted. Meanwhile, my zoom camera quit working, the lens will not retract and I'm looking for a new camera. Also, the washdown pump backflush staarted to leak so Rudy and I took a ride into the Holiday Inn dinghy dock (great convenience) and walked over to the nearby Westmarine store. Unbelievably they actually had the exact size part I needed. Usually what I want is represented by a blank space on the rack but not this time. So a few more todo's accomplished today. Wednesday is a long day to reach Fishing Bay YC, 57 miles in all so we'll leave to 8:00 am and to be there by 4:00 we hope. Tonight appears to be perfectly calm and not crowded, a great anchorage on the way south, much recommended. The answer to yesterday's quiz is tricky since several of the answers could be correct. 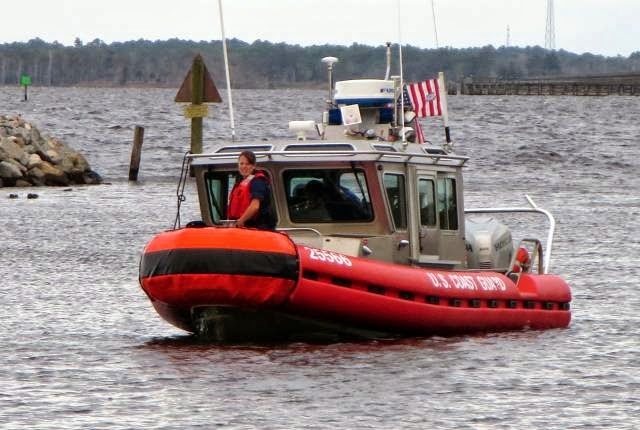 However, the answer that most closely matches experience on the ICW is "D", slow down and the overtaking boat will also slow down and pass you on your port side about 90% of the time. For the remaining 10% of the time, the boat will not slow down eliciting gloomy looks all around. You're supposed to call ahead on VHF and ask permission to pass but no one ever does anymore. Q4: You're approaching a bridge that will open on schedule in 10 minutes if boats request it. The boat ahead of you just asked for an opening; What should you do? C. Same as "B" but also listen for a response from the bridge operator that you were actually heard. It's starting to get a little chilly down here, in the 50's in the morning so it's time to get serious about moving further south! 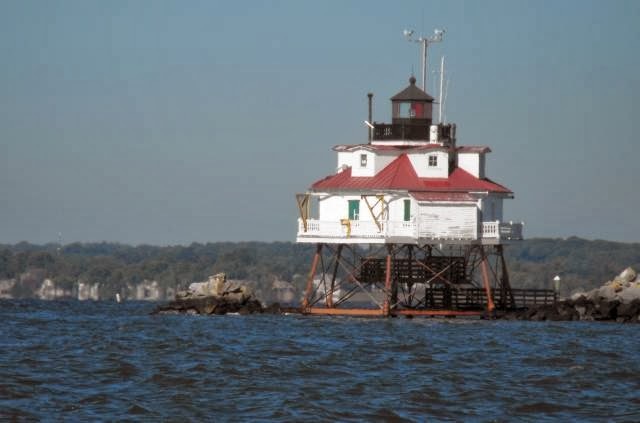 To help us in that respect, Rudy Colich and Alison Kaase joined us today for the next week where we intend to complete the leg down the Chesapeake and on to Elizabeth City, going through the Dismal Swamp along the way. Ego Alley dinghy dock, note the ducks ready to decorate your dink! No trip to Annapolis is complete until you have a Painkiller at Pussar's on Ego Alley. 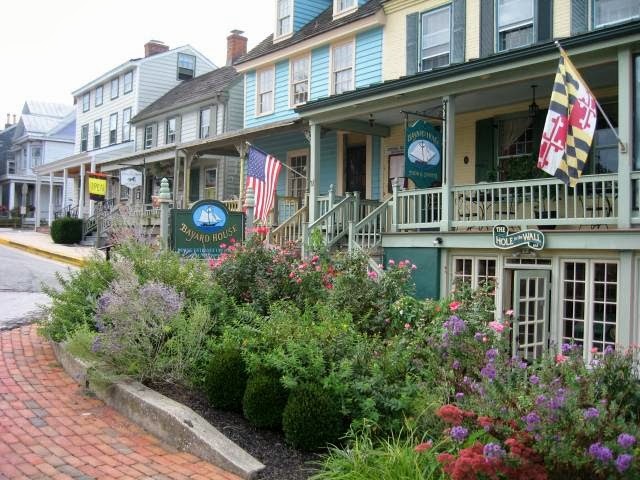 We've been to all three of their restaurants in the BVI and were elated to learn they opened one in Annapolis. So with Alison's gift safely tucked away, Rudy led the way to Pussar's and we all ordered our Painkillers. The restaurant specializes in Caribbean dishes so I had the jerk chicken, very spicey. We're in the cockpit now, night was fallen and it's dead calm. The lights of the harbor are bright all around, just a perfect setting for sharing with another crew. We'll start out Tuesday morning for the anchorage at Solomons, also very well protected. The answer to yesterdays question was "A". 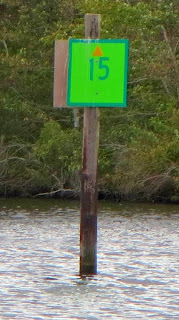 The markers for the ICW all have yellow triangles (reds) or yellow squares (greens) pasted on, much smaller than the marker itself but visible. There are a few places where a yellow triangle may be on a green marker! If so, treat the marker as if it were red for the purposes of following the ICW. A. Continue at your normal pace and direction and the faster boat will pass where there's the most room. D. Same as "C" but let the overtaking boat pass on your port side. The bridge on the canal has to be very high to pass ocean going ships! It was a glorious layover day at Chesapeake City anchorage. It rained buckets last night, at least several inches. The dinghy was filled with water. However, the day dawned clear and with the sunshine, the cockpit warmed right up. There's a small craft advisory out for the bay so we elected to sit today out. The anchorage is so protected that little wind gets to the anchored boats, peaceful. This place rocks on the weekend and all the restaurants like to share their music with the anchored crowd, how nice of them. Although it can get crowded, the holding is very good after the dredging last year. We took a walk through town where they had 10 artists in various locales throughout the town doing live paintings that you could watch in progress. As to the answer to yesterday quiz question: "C" is right. The water sloushes around turns to the outside and with the higher volume and speed, the outside of turns is (almost) always deeper. On straightaways, just stay in the middle. 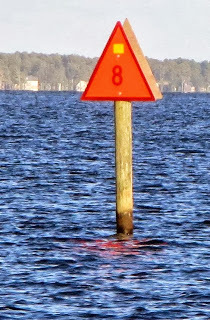 Q2: The ICW is marked with red and green buoys but the ICW often passes by inlets with their own red and green buoys, how do you tell them apart (so you don't inadvertently go out an inlet instead of proceeding down the ICW)? 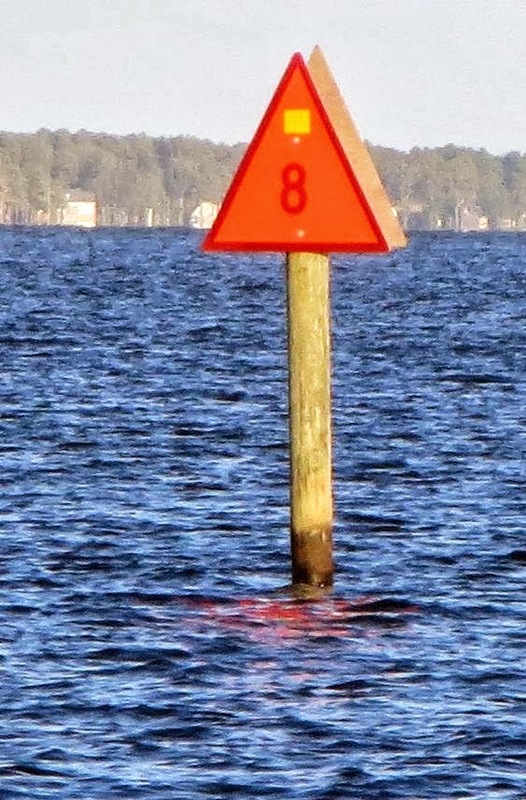 A: The red ICW buoys and daymarkers have little, yellow triangles on them and the green buoys have small, yellow squares. C: The ICW markers have numbers that all start with 1000 and go upwards (e.g., 1001, 1002, etc) The regular markers never go that high. Kind of a pretty anchorage and protected from waves from the Bay - with Hoolie relief! It was an easy ride to Chesapeake City in the Delaware - Chesapeake Canal. The city has an anchorage for visiting cruisers that is free to use and they even dredged it to 12 ft last year. Clearly, they want cruisers to feel welcomed and to spend their money in town. 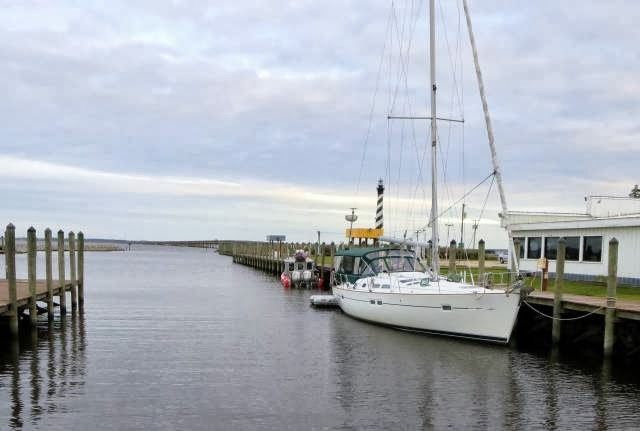 There's also two marinas where you can pay for a slip and the town also offers three bulkhead slips for visiting boats for free, very friendly town! There are multiple restaurants and there was a wedding party in town with the ceremony set up on the town green. We're at the far end of the anchorage, away from the "free music" of the two restaurants and close to Hoolie relief at a nearby dinghy dock. The weather forecast (for what it's worth) predicts strong winds for the next 24 hours with lots of rain and a small craft advisory for tonight. With that we'll sit out Sunday at the anchorage here and take life easy. Monday is much better with 10 kt winds out of the north, perfect for sailing to Annapolis to pick up Rudy and Alison for the next leg of the trip. The anchorage can get crowded but there's still plenty of room - can you spot Fleetwing? So now it's raining and Hoolie and I are drying off from our run into shore in the dinghy. Regardless of the weather, Hoolie has to get into shore! We're hoping for a calm night. A: Take the shortest path between buoys, don't waste time. Lies, lies and more lies! The weatherman is not to be trusted! He speaks with a forked tongue! It doesn't matter if he's from NOAA, the Coast Guard or Grib, they all lie. You would think that with all the modern technology, including weather satellites, that they could get the weather correct for the next 8 hours... Wrong! Well, they got part of it right. 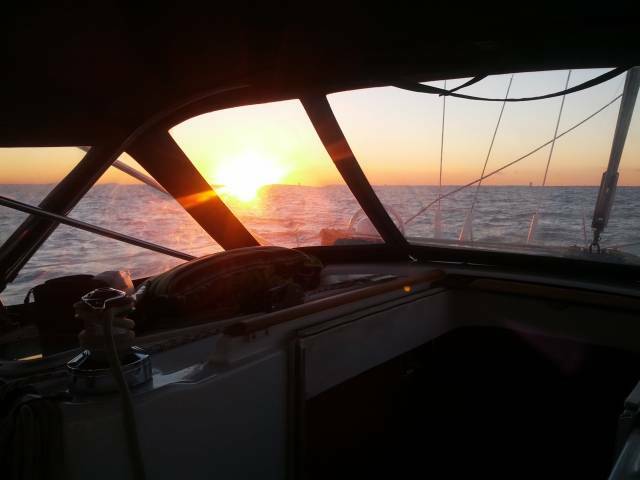 We left this morning from Atlantic City with the predicted 5 to 10 kts of wind and had a perfect ride down to Cape May. We were due to arrive at 1:30 pm and so we thought, "Why not go further?" given the excellent weather with the light winds. So we turned the corner at Cape May and went through the canal at low tide and headed out into the Bay. It should have been a perfect day until the wind chose originality vs the dull old prediction. 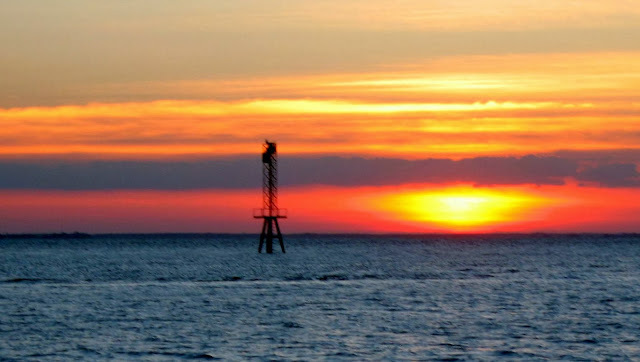 Thinking about the next few days, we thought we could make the Cohansey River anchorage by 7:00 pm, just before sunset so our next day's journey to Chesapeake City would be a short, morning jaunt. Well, as we rounded out of the canal, the wind piped up to 15 kts and shortly we were seeing 15 to 20 all the way into Cohansey! The weather chart said 5 to 10 kt winds, the wind meter on our boat showed 15 to 20! So much for forecasts! We were pushing the edge of acceptability on current since the current was still outgoing when we came out of the canal. So we had wind against tide all the way north but at least the wind was behind us, the only thing in our favor. Eventually we did make Cohansey by 7:00 pm and we hurried to take Hoolie ashore for the first time since this morning. He hopped back in the dink covered in mud. We were at a low tide and the water level was below the sand line, mud all over him and the dink. After an extensive rinsing on the back of the boat, Hoolie was presentable and he had his evening meal. Regardless, we still had our evening wine (got to keep your priorities straight!) and Ann prepared tuna and melted cheese sandwiches, tasted great! We are now snugged in our anchorage with no other boat in sight but with a full moon, beautiful. We plan on leaving Saturday around 8:00 pm to catch the tide going north. 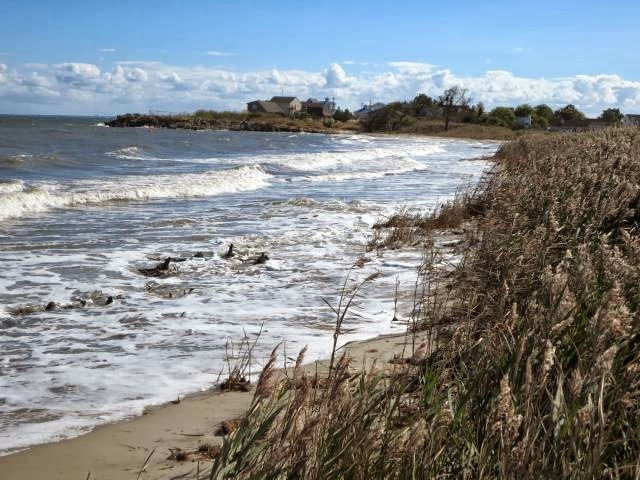 The prediction (for what it's worth) is for north winds for the next several days which is going to present a problem for all those boats at Cape May waiting for a weather window! 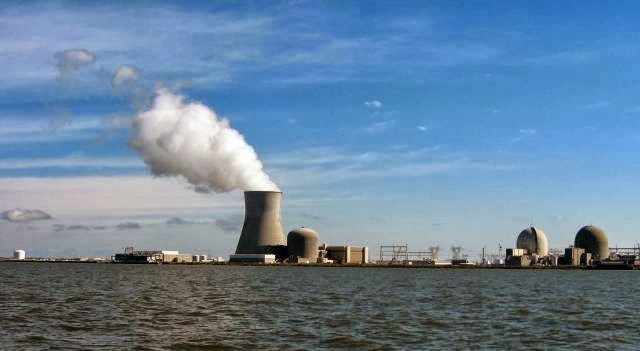 Since you want a tide with you going north, a north wind would be wind against tide, not good at all for a trip up the Delaware Bay. I think we lucked out on our decision to push on today. Hoolie did fine on his long wait between shore leaves. Kudos to Hoolie! In thinking about the trip down the New Jersey coast on Wednesday, the weather forecast needs to be interpreted differently. The forecast was for 3 to 4 ft waves but with 10 kts or so wind. Now 4 ft waves are a little higher than we wanted to spend 11 hours experiencing but we went anyway. The interpretation part was in realizing that the wave action reported was from long period swells of 10 to 12 seconds. They didn't break, just rolled under the boat, hardly noticeable. 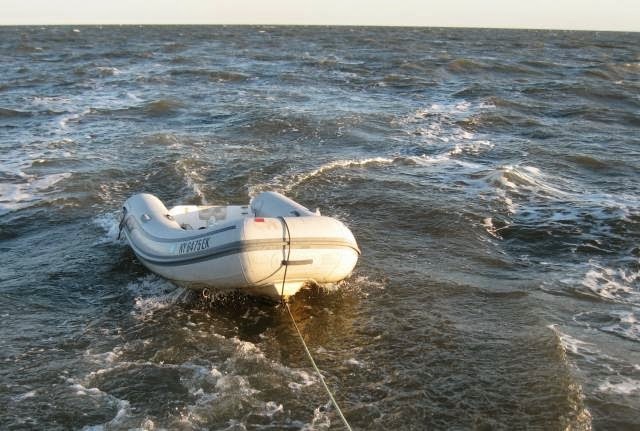 Since there was very little wind, no wave action was generated from the wind and so the boat rode smoothly. In the future we'll tuck that info in our experience bucket and know better how to read forecasts for a smooth ride down the coast. Phil and TJ Bowdler left today to return to PYC. They found a "Getaway Special" from Hertz for only $56 one way to Poughkeepsie, NY. So we said our goodbyes and they got off in the morning. Meanwhile, we did a needed wash so we would have fresh sheets for the aft cabin, refilled the water tanks and washed down Fleetwing's topsides. The marina here has seen better days. They had said a renewal project for the marina was going to happen last winter but it never did. The docks are rather worn and at the current rate of $3/ft, overpriced. 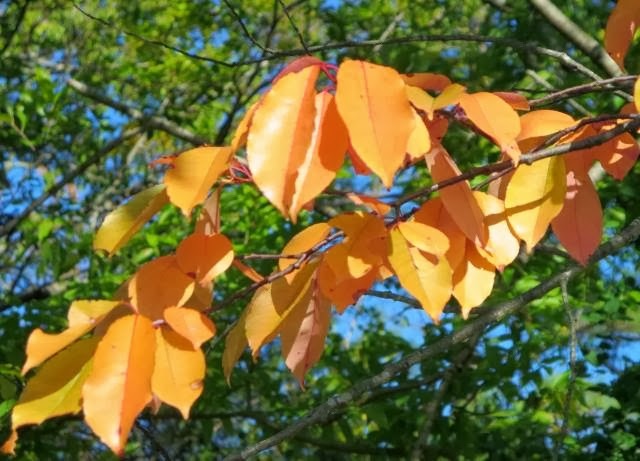 They were supposed to go on winter rates ($2/ft) but this years it's been delayed until the first of October, every year it gets a little later. If that wasn't bad enough, the transient docks are covered with the residue of seagulls digestive output. I spent about an hour washing down our docks so we could walk to shore without messing our shoes. We've been here two days and we've yet to venture inside the Golden Nugget Casino, no attraction for us there. Clearly the casinos here are hurting. We'll leave early Friday morning for Cape May for an overnight anchorage by the Coast Guard station and look at the weather. So far it looks good for a run up Delaware Bay to the Chesapeake City anchorage on Saturday. 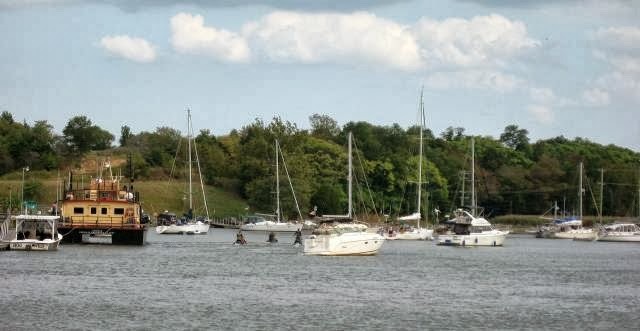 The next leg to Annapolis will be either Sunday or Monday, most likely on Monday if the currently weather predictions hold for storms over the weekend. 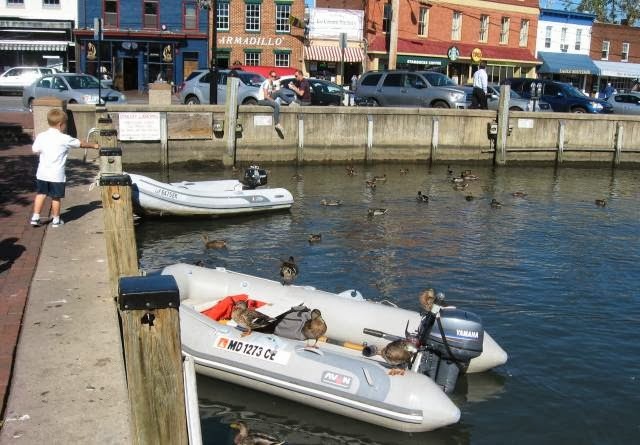 We plan on new crew in the form of Rudy and Alison boarding at Annapolis for the trip south down the Chesapeake and perhaps to Elizabeth City if the weather holds. The trip down the New Jersey coast was one of the smoothest rides we've ever had. The Coast Guard forecast was for 3 to 4 ft swells out of the east but they turned out to be nothing of concern. There was no wind and so there was no chop and the ride was smooth. What a different compared to last year! Got off our anchor at 6:00 am and headed to round Sandy Hook and got to Atlantic City by 4:30. When there are no heading seas or wind, you can make good time. This is the last day for Phil and TJ Bowdler. They found a rental car from Hertz within walking distance of the marina for $60 one way to Poughkeepsie, not a bad deal at all. We'll see them off in the morning and do a wash and refill our water tanks. 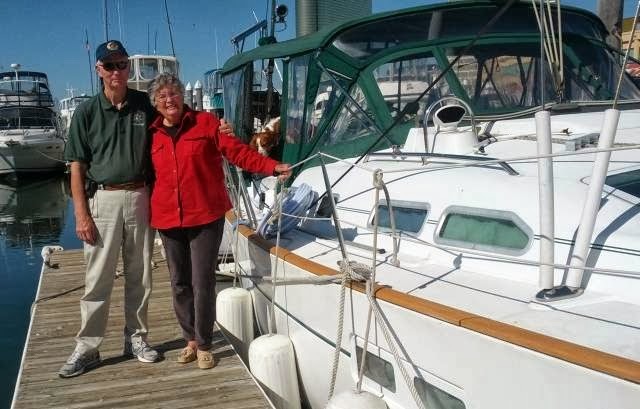 On Friday we plan on continuing on to Cape May and then Saturday to Chesapeake Ctiy followed by Annapolis by Sunday afternoon if the weather holds where we hope to meet up with Rudy and Alison. 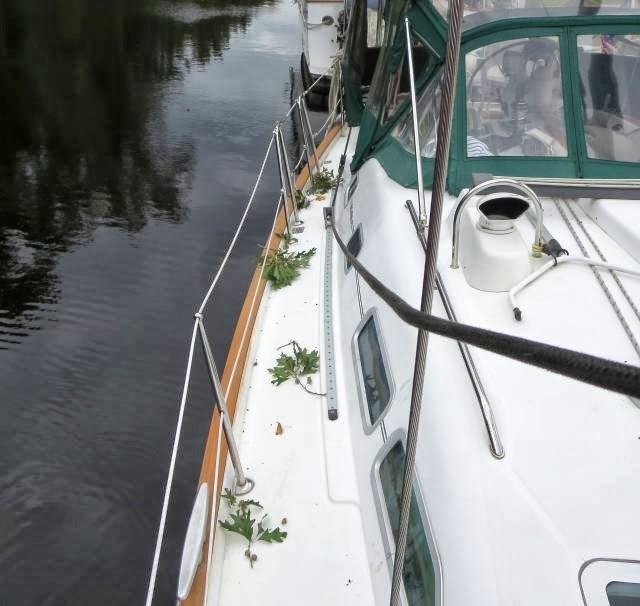 So far everything has behaved itself on the boat, including the genset and the outboard which hadn't been started for three months, no problem. Hoolie has settled back into the boating routine as we ourselves have. Nice to be back on the water. 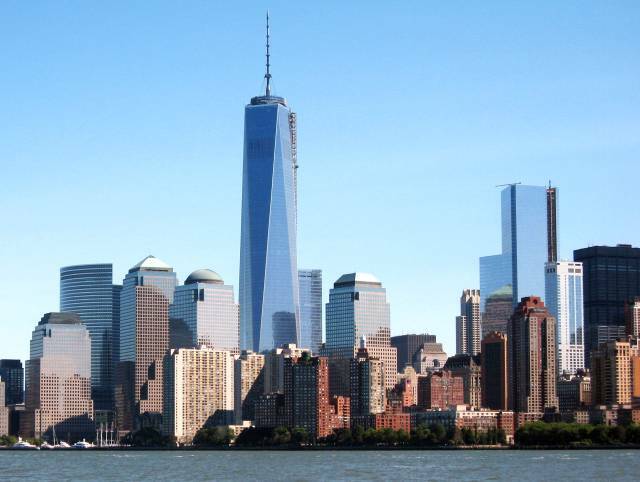 The Freedom Tower is done! Last night was a lesson in where not to anchor! We had listened to the forecast for calm winds of 8 to 10 kts out of the northwest, perfect for the Hook Mountain anchorage just southwest pf Croton Point. Well, the forecast didn't match reality! Around 5:00 pm the winds started building out of the north and sometime during the evening peaked out at 26 kts! We were anchored in a sea of whitecaps with plenty of rock and roll action. Getting Hoolie ashore was an exercise in whitewater rafting! After a long night, we were ready to leave in the morning, even without our morning coffee. Phil helped me get Hoolie ashore amid the 2 ft waves and off we went. When the tide turned south, we found calmer water after the George Washington bridge and made the Atlantic Highlands anchorage by 1:30. We found the marina there completely rebuilt. All the docks have been replaced that were damaged by the hurricane. They also had a dinghy dock in second fairway beyond the fuel dock for use by transients and we got ice at the security center nearby. Now it's very calm and we're looking forward to a calm night for catching up on what we missed last night. We'll need it since we plan on being off the anchor by 6:00 am at the latest on our route to Atlantic City. Phil and TJ Bowder will be leaving us there to rent a car for the trip home. 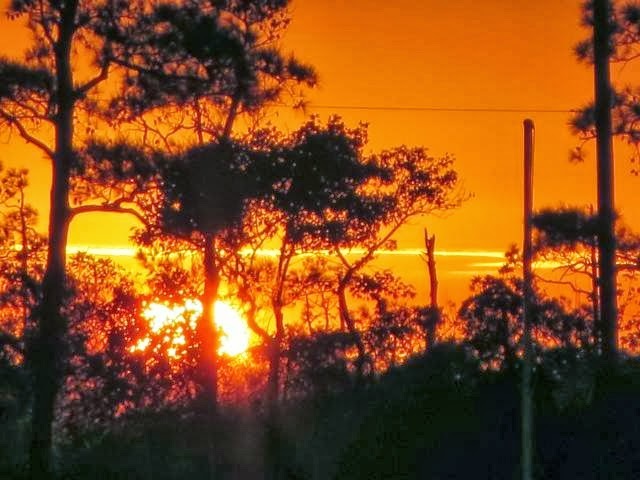 We don't know yet if we'll stay another day or just head out the next day for Cape May, depends on the latest weather report, however unreliable they've been so far! Went to turn on the camera today and found that the lens would not retract and the camera would not function. So for today I am without photos! I have my old camera still with me and the camera on the iPhone5 which I can use as a backup, will do so on Tuesday. We made it down to the Hook Mountain anchorage in Haverstraw Bay and will start out Tuesday morning for the Atlantic Highlands anchorage that night. Except for the camera, everything else is working. The outboard started up without a hitch after three months of idle time and Tuesday morning we'll try out our new genset again. The passage down the coast to Atlantic City still looks good for Wednesday although the Coast Guard forecasts have varied between 3 to 4 to 3 to 5 ft waves all day. At last look, it was back to 3 to 4 ft waves, still higher than what we would like but doable. So on Tuesday we'll transit New York harbor with all the ferry traffic and anchor at Atlantic Highlands in preparation for a 5:30 departure on Wednesday morning! Everybody here is getting ready to take their boats out of the water for the winter but we're preparing to leave for 9 months of cruising! Oh for the cruising life, but the cruising life involves a lot of preparation. For the past four weeks I've been getting the boat ready for another season. New bottom paint, another layer of wax, redone teak and a thorough cleaning is all included in the task list. I had become dissatisfied with my long time favorite bottom paint, Interlux Micron Extra, since I've had to get a diver to scrape the bottom twice a year, it grew barnacles very well! A diver recommended a switch to Pettit bottom paint and last year I applied Pettit Ultima SR60 and the difference was like night and day. No barnacles, no "skirt of grass" along the bootstripe and when I hauled the boat, the bottom really didn't need another coat of paint, it was very clean. 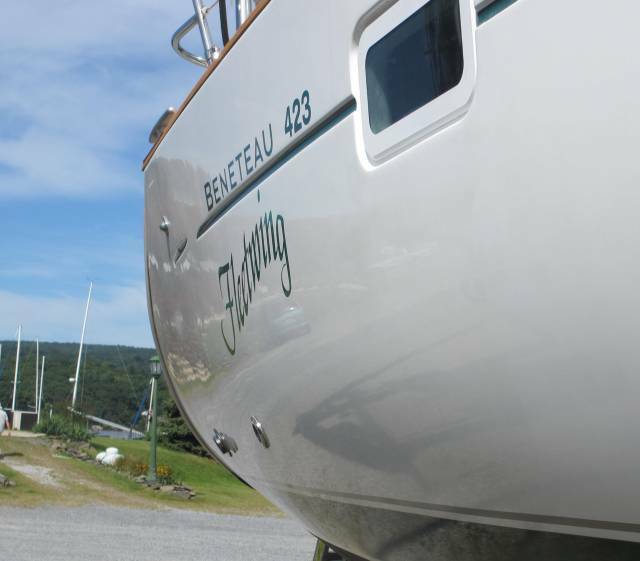 So although the Interlux held up well in Long Island Sound and Maine, it failed the test of the ICW going south! Meanwhile, we've been watching four weather forecasting services and the variability of the forecasts matches our experience with weather forecasting itself - very undependable. However, you have to go with something! So we have been watching NOAA, Stormsurf, Surf Forecast, Marine Weather and we've finally decided to take our chances down the New Jersey coast on Wednesday. 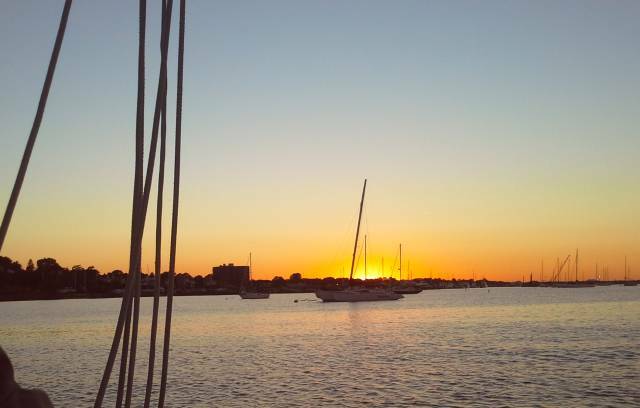 With that, we'll leave PYC Monday morning, anchor in Haverstraw Bay that night, anchor at Atlantic Highlands Tuesday night and then make the dash to Atlantic City on Wednesday. Waves are forecast to be 3 to 4 ft, not ideal in my view but the best of the days. The Atlantic has been churned up by two named storms and will take awhile to settle down, longer than we want to wait. I'll have Spot on Monday for our trip down the Hudson River so you can keep an eye on our position as we head south. We have Phil and TJ Bowdler on board for crew for the trip to Atlantic City, should be fun!